Unaccompanied and unadulterated clawhammer banjo (mainly fretless). Old-time, Hungarian, German, Chinese, French and Celtic. Both wild and mellow. The 5-string banjo as complete in itself! Steve Baughman takes the clawhammer banjo on a journey to places it rarely goes, while never straying far from the authentic "bum-ditty" pattern of old-time American music. 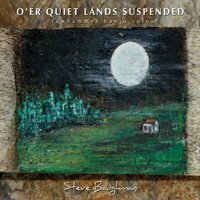 This is an album of clawhammer banjo solos, with Steve singing on three tracks. He is accompanied by the Indian tanpura on two tracks and the Chinese erhu on one. Of the seventeen tracks, twelve are played on fretless banjos, two of which are gourd banjos. This album is not just for banjo officionados. Its diverse textures and rhythms make it good listening for anyone with broad musical tastes.